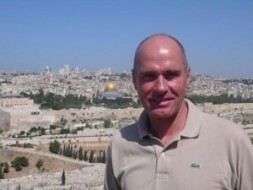 German entrepreneur and geostrategist Dr. Hubertus Hoffmann, President and Founder of the independent World Security Network Foundation, in front of the Holy Old City of Jerusalem: "The new movie The Heart of Jenin has been picked as one best practise examples in media in our Human Codes of Tolerance and Respect project - see www.codesoftolerance.com for details - as it shows humanity and reconciliation in the long-running Israel-Palestine conflict. For us the promotion of tolerance and respect is an important tool in the box of soft factors of peacemaking and essential for networking a safer world. The Holy Land - like many areas of conflict - needs a new effective double strategy of power and reconciliation. Real peacemaking needs deep reconciliation. Or as Eric Hofer said: 'A war is not won if the defeated enemy has not been turned into a friend'." On November 5th, 2005, in the Palestinian refugee camp of Jenin, 12-year-old Ahmed Khatib was severely injured in the head by an Israeli soldier and died shortly afterward in the hospital. He had had a toy gun in his hand which the soldier has mistaken for a real gun. His father Ismael, who himself had sat in Israeli prisons as a Palestinian activist, donated the organs of his son for children in Israel – the children of his enemies. He says, "My human action irritated the Israelis. That is something much bigger than to kill a soldier". Menuha now lives with the liver of the young Palestinian. She is the daughter of an Orthodox Jewish family who thanked father Ismael for his unique gesture of reconciliation. The Israeli Druse girl Sameh lives with the heart of the killed boy, and also the Israeli Bedouin boy Mohammed lives, because Ahmed had to die. The German documentary maker Marcus Vetter and the Israeli Leion Geller filmed this moving story and thereby recorded a convincing template in the media for a best practice for respect and reconciliation. The film “The Heart of Jenin” is a great deal more powerful and illuminative than the usual news clips in the evening news about Palestinians throwing rocks or shooting Israeli soldiers, and proves how "soft" human issues of tolerance and respect can open our hearts. It shows humanity, greatness of thinking and that tolerance and respect can prevail – in the end. In order to support mutual respect and reconciliation, the World Security Network Foundation is promoting universal Human Codes of Tolerance and Respect. Please visit our special website: www.codesoftolerance.com. We picked the movie “The Heart of Jenin” as one of our best practices for media promoting a better world for our children. The Human Codes of Tolerance and Respect project addresses the five affinity groups who have the most influence on promoting tolerance and respect towards other religions and ethnic minorities: families, educators, religious leaders, journalists and politicians. We include 10 best practises for each of the groups from all over the world to show how each group can promote a tolerant world now. For the World Security Network, tolerance and respect are the lifeblood of peaceful coexistence and crucial elements of the “soft powers” of peacemaking. 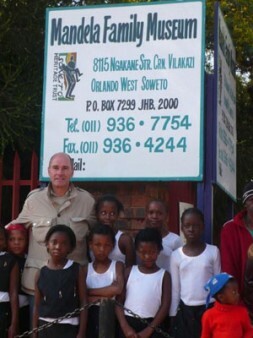 Promoting The Human Codes of Tolerance and Respect in South Africa, here during a visit of SOWETO in front of the former house of Nelson Mandela: "Treat everybody’s children as if they were your own. It is paramount that children are brought up not to hate. We should no longer view others in the obsolete categories of enemy and friend, but rather accept others in their complete humanity and see them as an enrichment—not as a threat and an attack on our essence." We need a global vision and a soul. We need globally respected moral values, and just as importantly, we need a steady promotion. Unfortunately, today we leave the most important questions of peace, reconciliation, tolerance and respect to a loud but tiny minority of radicals, a majority of mediocre politicians, and mainly backward-looking academics. Please mail me your ideas and best practises to integrate into the Codes of Tolerance to [email protected]. and to all a peaceful Holiday Season and a Happy New Year of 2009!